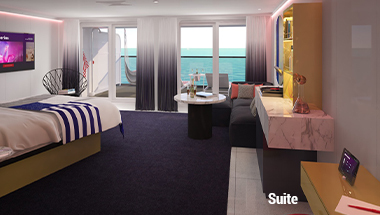 Virgin Voyages is one of the first adults-only upper premium cruise lines sailing April 2020 from Miami - 4 & 5 night cruises. The Scarlet Lady will have a modern, yacht-inspired aesthetics and clever cabin technology makes for more than just a space to live (or dance). With wildly luxurious interiors and outdoor spaces that rival most people's apartments, these suites get you exclusive access and personal attention. The ship will have a nightclub called The Manor, a nod to the name of the first music studio associated with Virgin Records. The club's color scheme will be aubergine and emerald with gold accents. Richard's Rooftop, an outdoor club reserved for suite guests. Virgin said it will have a futuristic look, with circular loungers, large umbrellas and accents of dichroic glass, which will cast rainbow-colored reflections across the lounge. The club's is named after Virgin Group founder Richard Branson. 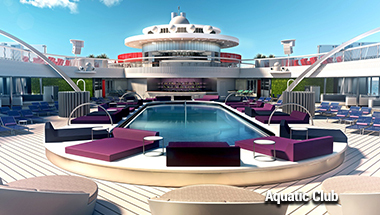 With smooth curves and nautical details, we've created a pool deck with the sophisticated glam of a contemporary yacht. Whether you're looking to sunbathe in one of our daybeds or let last night's choices melt away in the pool, you can detox and recover, or start the party all over again. On Deck 7, cruisers will find an area called The Dock, described as "an outdoor, lifestyle space with a focus on relaxation, socializing and an appreciation of the gorgeous views the ship provides." 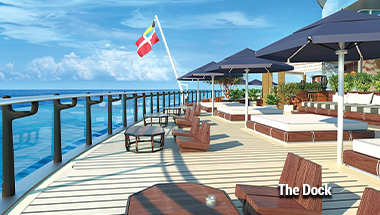 Virgin said The Dock "is reminiscent of the chicest seaside lounges in the Hamptons, Ibiza, Bali and beyond". The Athletic Club, and feature a white-and-red striped semicircular lounger described as the largest daybed at sea. The club is positioned across the aft with a 220-square-foot area of triple netting, where guests can lay out and overlook the open space and decks below as if on a catamaran. There will be 10 cabanas in the club and a bar. The Test Kitchen restaurant will be playfully scientific with light fixture images that mimic the periodic table of elements. 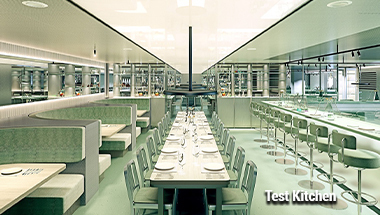 The Test Kitchen's laboratory-like environment is accented by metallic furniture, sleek clean lines and comes replete with beakers, test tubes and volumetric flasks. Pink Agave will be an upscale modern Mexican restaurant, featuring electric-blue metallic lighting fixtures that cascade from the ceilings above oversized banquets that line the dining room's portholes. An elongated, curved lounger centers the room, surrounded by round tables for two and flanked by a bar area in the foyer and a private dining room for larger groups.